I thought I would write a little about a subject I know is something that many are curious about and is not discussed as much as it could be. 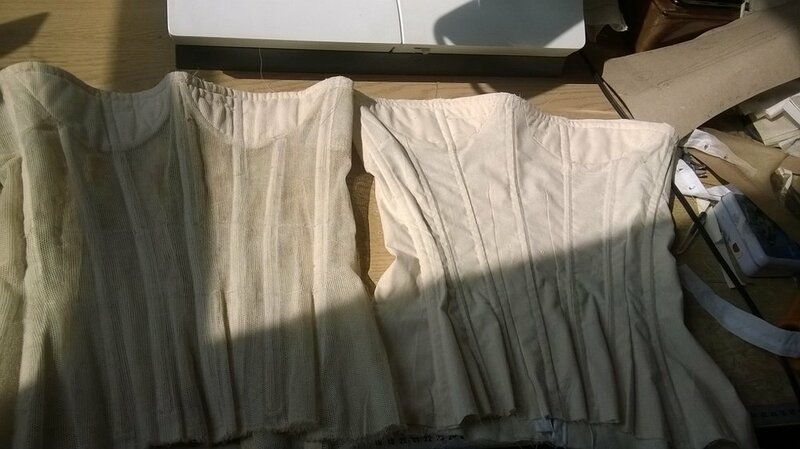 A few years ago I was lucky enough to be loaned a few Dior inner corselettes to study. Something I was delighted about. I copied one exactly and then took the pattern on to become a proper reducing corset. I was loaned three variations from the 1950s. One in the dress, one with a petticoat attached and one on it's own. They all differed in shaping but had most basics in common. None were waist reducing in any substantial sense, very much corselettes rather than corsets. All were bobbinet, and all double layer and cut in opposing directions. I counted the 'holes's and compared with some samples Julia had. So the bobbinet stocked by Sew Curvy is as close as possible to that used. All were boned with 5mm spiral steel. Usually in ribbon casings. Also on the rear closure. Visible boning, showing how light the construction was. All had waist tapes of grosgrain ribbon. All had hand worked hooks and eyes mounted on the rear closure reinforced with ribbon. Some had organza and/or horsehair for structure at key points. What was notable was the lightness and flexibility of the construction. These were strong but lightweight. 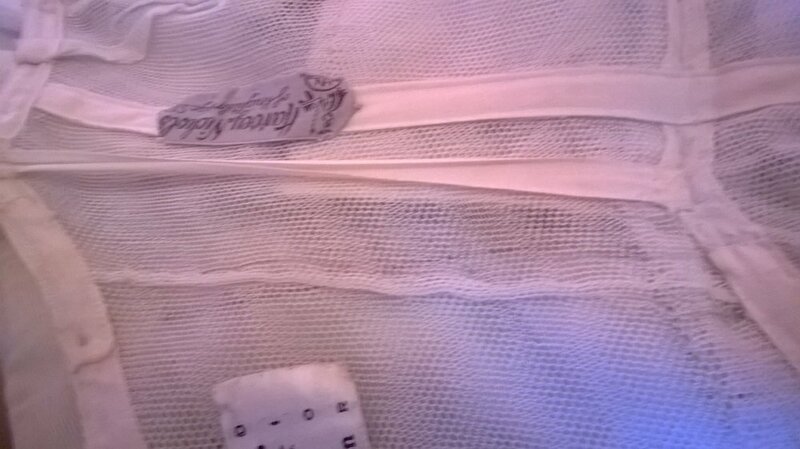 Petticoats were stitched to the bottom of the corslette allowing a dropped waist to avoid bulk. They were attached to the top edge of the gown by hand. Some had evidence of thread chains at other points such as side seams, but no solid attachement. The waist tape usually fastened with a separate hook and eye to allow it to be closed independently of the gown. 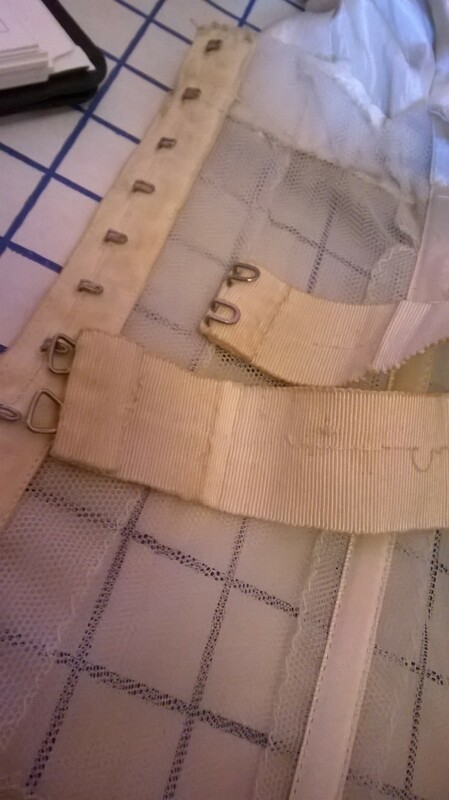 This shows the ribbon channels, the separately hooked waist tape and the hand overcasting on the seam allowances. The one I copied had demi cups for lift. The above picture is the old and the new. The original is on the left, the repro on the right. Not the bobbinet I used on the corset below, which is closer to the original. This was supplied by the client, and then dyed by her which changed the handle. However the pattern is identical. To translate that pattern into a corset, I simply reduced the waist and added a front solid bone and a lacing closure. I've always intended to add a petticoat but it's never happened sadly. So here it is with a tulle skirt on our own Morgana. Photographed by Louise Cantwell. If I was building this more waist reducing corset into a gown, I would treat it the same way. Attaching a petticoat to the bottom edge and the corset to the inner top edge of the gown, which would be fitted to close over the corset. The inner laces would be left free with the outer zip closing over it. The gown could be more firmly attached at the rear, incorporating the lacing through the two parts. Fitting to the wearer would be key. Modern high end bridal gowns still incorporate inner corselettes, albeit now more likely to be powermesh and plastic boning. But if you can, they are worth a look to see how the construction is ordered. Oxford Conference of Corsetry. An annual conference for corset makers of all skill levels held at Jesus College, Oxford.